The Force Awakens is still a torturous eights months away, but here's a video that will help you get through at least a minute of that. 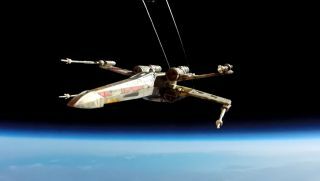 Two people from Essex, UK, have managed to send an X-wing fighter model up to the edge of space and film it. Using high-altitude balloons and GoPro cameras, the duo got the ship up to a height of around 36,190m before it fell back to Earth. All for the price of £1,200 (about $1820, $2310). Worth it. Can we get these guys some tickets?